Another busy week for the club with the April Handicap held on Wednesday evening (click here for all the details) , The Annual Ball on Friday Night (click here to read the full list of winners) and the Club Volunteer Pacing Event on Saturday at Rushmoor (More on that shortly). Onto Saturday morning and starting at Frimley Lodge, Matt Jones ran his fastest 5k of 2018 to lead the club members home in 20:09. Caroline Stuart recovered well from the Manchester Marathon and capitalised on all the hard work to grab a new PB in 23:31. Simon Whillis reached the 150 Parkruns milestone, more from him later in the week, and Tania Strange ran her very first Parkrun. On the Great Hollands Rec course at Bracknell Colin Carpenter was the first member home. Susan Plumb and Patricia Marshall also ran well with Mark Neve already back in action after Manchester pacing the Run/Walkers. Rushmoor was the big draw for members this week with SJ Volunteer Pacing Event. Sandhurst Joggers were visible throughout the field of 493 runners with Graham Robinson finishing in 1st place in 17:22. Throughout the field we had 17 pacers covering times from 22 to 45 minutes. Our efforts were very well received with lots of thanks and positive feedback plus 74 runners achieving PBs on the day. From a members’ perspective we had a number of first timers at Rushmoor; Max Woods, Sacha Kendall-Woods, Jon Green, Andrea Hadfield and Jackie Kent. Most pacers were very close to target but the Gold Medal Pacers of the day were Louisa Enriquez and Blanche Barnes who were 100& spot on their target times! Just two trips away this week and they were both relatively local tourism with Graham Bolton making his first and fastest appearance at Alice Holt while Robert Jerrett ran a superb time of 19:26 at Woodley to score an outright PB. Neil Praine finally achieved one of his most elusive targets at the Windsor Spring Run and Duathlon series 10k; running a sub-40 10k before his 40th birthday. He ran a really well measured effort, 20:01 for the first 5k then turned up the pace to finish in 39:49 for 10th position overall. The second weekend of the Big Spring Marathon season saw runners descend on the South Coast for Brighton Marathon. Unfortunately illness ravaged Lisa Hale and Stuart Overhills races as both were forced to withdraw leaving Alison Jones and Monica Burbidge as our only representatives. They both overcame tough races to finish in 4:38:16 and 6:26:35 respectively. Also in Brighton and just a week after the Manchester Marathon, Jim Laidlaw made the trip to the south coast for the Brighton 10k finishing in 41:13. Collette Callanan had a superb run in the Croydon Half Marathon finishing in a PB of 1:25:47 to take 1st Female and 14th Overall in the race. Barnes Fitness organised the Woodley 10k starting in Woodford Park, Woodley. We had six members in action including the four in the official results below, plus Teresa Milroy who finished in 57:17 and Charlie St Aubyn who marshaled the 2.5k fun run before doing a solo lap of the 10k course in well under 50 minutes. The Brutal Alpine Trail Event was held near Bagshot with both 5 and 10k options and it proved popular with our ‘mudrunners’. Karen Page, Angela Foker, Mark Foker, Nigel Evans, Gareth Hopkins, Lynsey Spring and Jacq Hudson all completed the super tough course. As always keep a look out on Facebook for details of the weekday evening runs. Monday: Patrick will be leading the Monday night chatfest from Sandhurst Sports Centre at 7:30pm. The route will cover approx. 6 miles and will either be on or of road depending on the ground conditions. This is one of the most sociable runs of the week and a great opportunity to catch up with friends or discuss the preceding weekend. And don’t forget the Monday Mantra ‘Mondays defo make me faster’. Tuesday Club Run: The Triumvirate of Tuesday General members Monica Burbidge, Dave Bartlett and Royston Crandley will be looking after the biggest club run of the week. As always there will be multiple groups to cater for all abilities from beginners through to faster and more experienced runners. It’s perfect for novices and those coming back from injury or a long lay-off because you can start with an easy group and work your way upwards. The start time is 6:30pm as always, this week from the Sandhurst Memorial Park. Wednesday: Sharon and Andrea are still the General Members for Wednesday and they have great route planned for this week. Join them at Sandhurst Memorial Park at 7pm. The ‘5k to 10k’ course moves into its third week and will be aiming to help those members involved progress. Thursday: This week the threshold/improvers run will be on the the Coat Hangers route and this week is the paced run week with a range of groups to fit with your ability. Meet at Sandhurst Sports Centre at 7:30pm and don’t forget lights and high vis clothing as it will still be dark on Swan Lane! Friday: Track is still free and the coaches have some great sessions planned for all abilities to improve fitness and technique. This is a great way to improve your running form and fitness, get faster and help prevent injury. If you’ve never ran on a track before give it a try, it’s a lot of fun and you are never more than 200m away from the start. Parkrunday: Lots of members will be action at Parkrun at 9am on Saturday morning. Don’t forget your barcode! Sunday: Anybody not racing can join the crowd running from The Lookout at 9am. It’s a flexible run to suit everybody’s needs and is either adapted to fit with distance targets or multiple groups are formed. The three ‘Cs’ of Coffee, cake and chat are enjoyed in the cafe post-run. 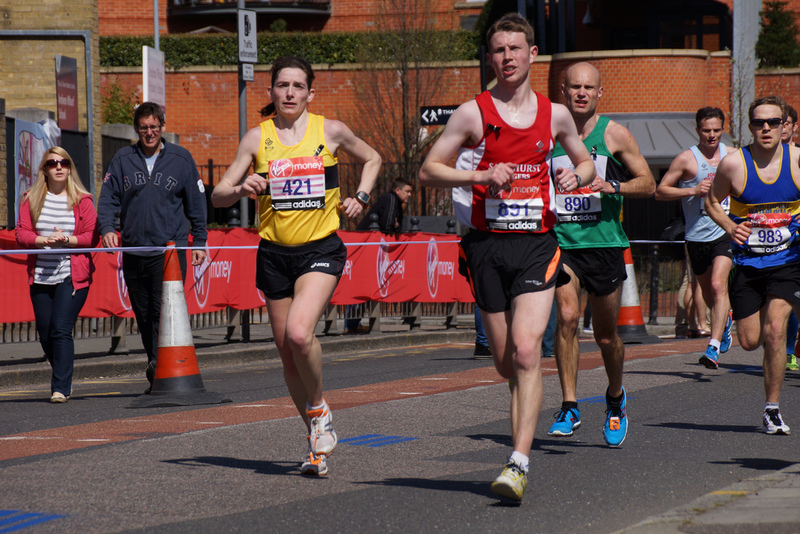 Of course Sunday is also London Marathon so we wish all our members who are running well. Many members will also be marshaling at the finish and supporting so no doubt we will have lots of tales from the event! ← SJ Annual Ball and Awards – Who won what?